Quality Home with great income potential! 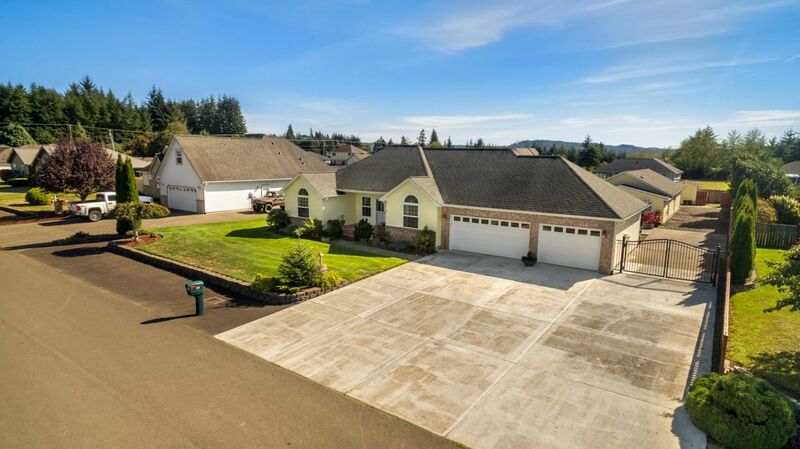 TWO HOME PROPERTY #1) MAIN 3 bd 2.5 bath 1797 sq ft Ranch Style w/3 car garage, property length dvwy Room for RV/BoatTrailers/toys, New HeatPump, KitchenAide DW, JennAir Rng, Subzero Fridg. The Great RM and Formal Dining have high w/high ceilings. Mstr Bdm w Ensuite, garden tub, and walk-in closet. Outside-1836 sq ft patio Entertainment Area w/ Fire Pit, UG sprinkler. UNIT 2) Detached 1200sq ft open plan cottage/Rental + 200 sq ft attached shop with full-length overhead attic storage. All appliances, separate laundry room & off-street parking. Great garden with raised beds, mini orchard, a variety of Mature high yield berry bushes and gorgeous yard. Also tools & maintenance equipment included with property, for yard garden and orchard maintenance: Newer John Deer Riding Mower and utility trailer, Troy-Bilt Tiller; Walk-behind mower, compressor, lawn & leaf blower. Weed trimmers, Gas powered edger, new Pole saw for pruning orchard and landscaping, Large shop; Potting shed, Outfitted Green House, extra storage space, Great Outdoor Entertainment space, w/Fire Pit. Family friendly, safe neighborhood.